Where can I get the wall joint for my Doughboy 16' by 4ft deep pool? We had it in storage and now can't locate the strip that joins the wall together. Any help is appreciated. Hi Marg. Doughboy parts are the easiest pool parts to locate. Any Doughboy dealer can order them for you, and they are all over the place. Needing the Tops and the Side covers that attach to them for a 28 ft above ground Doughboy brand Swimming Pool. Originally sold by Thouin Interprises in Kingsport Tennessee. The pool is approx. 20-23 years old. Has Light Blue and white swirled colors on the outer walls. There should be 21 total tops and attachments for this size round pool. 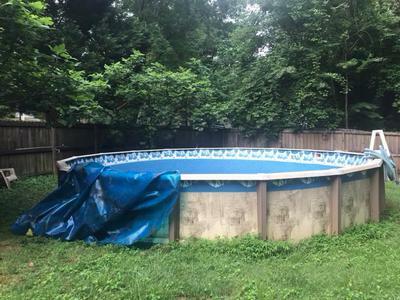 If you have an old pool, that is disassembled, it would be great to sell for the parts. They are very rare. i have these. how old is this post? I need a few Doughboy parts if you still have them? I think the pillars and brackets are the same for the bigger sizes. We can drill our own holes if they are a bit off. Does anyone have any of the top rail caps for a doughboy pool. Mine is a signature series with the 10 1/2 top rail. I have good used Doughboy pool parts in DeWitt IA. Contact me at my email if interested: krdmld@hotmail.com. I have a used pool, 16' x 32', I need the metal pieces that the outside metal liner sits in. Hi. It sounds like you need the bottom rails. The only company that made that size pool is Doughboy and all of their parts can be purchased through any Dealer. Doughboy has an authorized store in just about every major city. 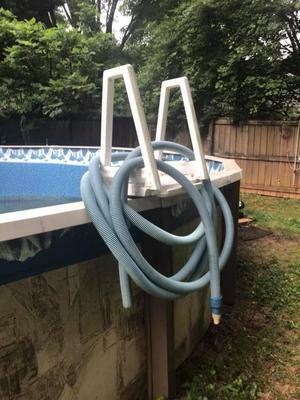 We bought a used Doughboy 16x32 Oval Pool, everything is there except for the Outer Connector Brackets & the Connector Support Brackets Part # 580-2159, # 580-1654, one type is L-Shaped and the other is like a L-Shape at each end, they connect the Top Connector plate and the vertical connector skirt to the end cap and to the support vertical. I need 8 of each, I found one place whom had them but it would cost around $150, is there anything else we could use? Our Daughter is wanting this pool up ASAP but I do not know what to do about these. Any Help would be Appreciated. Hi Bev. Any Doughboy dealer can order Doughboy parts. I'm not sure how to get them any cheaper unless someone has some they are willing to sell. Check back and see if anyone replies. Can we use l brackets from Lowe's? If so what size do we need? for the other ones - double l - we could take one & screw it to the other one and we would have a double l. Would this work? Hi. I'm not sure about the size but I don't see why this would not work. I need some 6 1/2" vertical uprights for my 24' Doughboy Blue glacier pool. I also need the 48" wall for the same. I would be willing to buy a whole set-up(Doughboy). Must be 48" walls. Thanks! We have an almost new Doughboy Desert Spring Oval Pool – 38’ X 18’, 52” high, including expandable liner, full print, 25 MIL. It was installed in April, 2010.It has a resin top rail but metal stabilizer rails and brackets holding the rails and plastic coping pieces on. We have severe rusting issues on these rails and brackets. We owned another Doughboy pool for 15 years and used a salt chlorine generator with it for 8 years. We have more rusting on the metal parts, which are inside the pool, in 2 years than we did in 8 years. The dealer where we purchased the pool wants at least $400 for replacement parts, which will also rust.We had a professional installer install the pool and would use them for replacement parts. Any ideas about how to rust proof the replacement parts before they are installed in the pool so that they won't leach into the pool water? Any ideas about how to protect the supports and bottom plates from further rust? We think we are going to have to replace these parts after swimming season. Also considering going to another purification system. Several family members are allergic to chlorine so prefer a non-chlorine based system. We used bromine early on and could not keep the pool water clean. I'm trying to find a supplier for the two steel bars that sandwich the seam on an above ground 21' x 52" round above ground pool. The make and model is a Prima V31036. I recently bought this pool used and this part unfortunately was not supplied. If there is no supplier available, does anyone know the specifics for this part ie. width and thickness so I can have one fabricated?? hi Erik. The only pool I know of with a wall bar is Doughboy. They can be obtained through any Doughboy dealer. 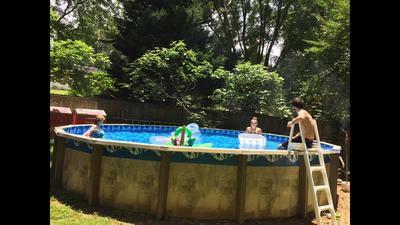 I have a Doughboy 24 ft. round pool. Several of the covers are broken and weather worn. I'd like to replace them and have spent days surfing the internet to find them. I have had no luck with that. Can you tell me where I might be able to buy new ones. It might help just to know what they are called for sure. It is the piece that just snaps right over the top rails where they come together. My email address is bratface13us@yahoo.com if you have an answer for me. Thank you for your time. Lisa D.
I have an old doughboy 28 foot round pool , the rails and endcaps are rusted. Any hope of finding them through anyone? I have Doughboy Pool, Blue Glacier parts to sell. and other Misc. parts that went to putting this pool together. Please Contact me only if interested to provide an image and price. Good luck finding the rails, this company is the worst I have ever dealt with for service. Want to buy a new pool? They are all over you. Need some top rails and connectors? Not so much. I am looking to replace 10 top seat segments on my 16 by 24 foot sundance doughboy pool... Where can I purchase? We have an older model round 18' Doughboy pool. Some of the metal curved pieces that make up the top rim are rusted away. Where can we find new ones? Building a used 24' Doughboy, in need of bottom rail track. I'm looking for new or used parts for my Doughboy Signature series pool. I'm not pickie, I will take what I can get so long as its good and works. Interested in top caps base plate and top plate if you still have??? I have 23 top rails and caps 4 foot long and 9 inches wide from an older Doughboy. Selling all for $190...Bad thing is I live in IA. Hi, I'm trying to locate Vertical End Cap for my Dough Boy Cedar Ridge pool. Parts #580-1183. It's a 34x18. I need 6 of them. My pool supply store hasn't been able to locate them. Does anyone know where I can find them? My daughter was given this pool and it's in very good shape. However, the Vertical End Caps part # 580-1775 are not in the greatest shape. The pool requires 32 of these, some are usable. Where can I locate these parts, I've been looking everywhere? Or are they obsolete? Ok, so I have had this pool for over 20 years and I love this pool. It is in great condition for the age. However when we moved we took our pool with us lol. After taking it apart we have found that it needs 2 new bottom rails and 6 new bottom plates. However we can not seem to find any parts out there for this pool. And for the life of me I can't even remember what model it is other then a Doughboy. Hi Olivia You just need to find a good Doughboy brand dealer, they should be able to help you.